The term septum, when used in reference to the brain (it is a common anatomical term used to refer to a partition), indicates a subcortical structure in the forebrain that is found near the midline of the brain. The septum in humans can be separated into two structures: the septum pellucidum and septum verum. Each of these is sometimes referred to on is own as the "septum," which can make references to the structure a bit confusing. The septum pellucidum, which is Latin for “translucent wall,” is a thin, almost transparent membrane that runs down the middle of the brain from the corpus callosum to the area of a large fiber bundle called the fornix. The septum pellucidum acts as a partition between a portion of the lateral ventricles, forming part of the walls of the anterior region of the lateral ventricles. It is made up of a thin two-layered structure that consists of white matter, some neurons, fiber bundles, and blood vessels. The septum pellucidum is surrounded by neurons that make up the septum verum, which consists of assorted nuclei commonly referred to as the septal nuclei. The septal nuclei themselves are often categorized based on location and are split up into lateral and medial (and sometimes additional caudal and ventral) divisions. What is the septum and what does it do? Little is known about the functional role of the septum pellucidum, and it is often treated as simply an anatomical barrier in many discussions of the septum. However, its connections with the hippocampus and hypothalamus suggest a role at least as a relay station between these structures. Although abnormalities of the septum pellucidum are associated with several neurological conditions, it is at this point unclear what role, if any, the septum pellucidum plays in directly generating the symptoms of such disorders. A bit more is known about the actions of the septal nuclei, which seem to be involved in a variety of functions, although their exact role in many of these functions is still relatively poorly understood. Additionally, most of what we do know about the septal nuclei comes from animal studies, as there is little research available on the functions of the septal nuclei in humans. The septal nuclei are considered part of the limbic system, a group of subcortical structures that are often linked to emotion but are really involved in a long list of functions in the human brain. The septal nuclei receive afferent (i.e. incoming) connections from other limbic structures like the hippocampus, amygdala, and hypothalamus, as well as the dopamine-rich ventral tegmental area. The septal nuclei also send projections to the hippocampus, habenula, thalamus, ventral tegmental area, and hypothalamus. One of the first functional roles to be linked to the septal nuclei was an involvement in processing rewarding experiences. In a now-famous group of experiments, researchers James Olds and Peter Milner found that electrical stimulation of the septal nuclei and several other areas of the brain seemed to be rewarding to rats. Rats, in fact, responded more strongly to stimulation in the septal region than any other part of the brain studied, leading Olds and Milner to hypothesize the septal region was perhaps the locus of the reward system. Although our understanding of the reward system has since expanded and less importance has been placed on the septal nuclei in favor of other structures like the ventral tegmental area and nucleus accumbens, the septal nuclei are still thought to potentially play a role in reward processing. Neurons in the septal nuclei give rise to axons that travel in the medial forebrain bundle, a collection of fibers that connects the nuclei with the hypothalamus and ventral tegmental area. The medial forebrain bundle is an important part of the reward system, thought to stimulate dopamine neurons in the ventral tegmental area in response to rewarding stimuli. The septal nuclei also are densely interconnected with the hippocampus, and through these connections may play a role in learning and memory. The septal nuclei and hippocampus are sometimes referred to as the septo-hippocampal complex, and projections to the hippocampus (which travel in a fiber bundle called the fornix and are often called septohippocampal fibers) are some of largest projections from the septal region. Although the precise role of the septal nuclei in memory functions is not yet clear, the hippocampus receives the majority of its acetylcholine projections from the septal region. These neurons are activated during learning and degenerate in conditions like Alzheimer's disease that are characterized by disruptions in memory processes. The septal nuclei have been implicated in a number of other roles such as social behavior and the expression of fear, and abnormalities in septal functioning have been linked to a variety of disorders ranging from depression to schizophrenia. 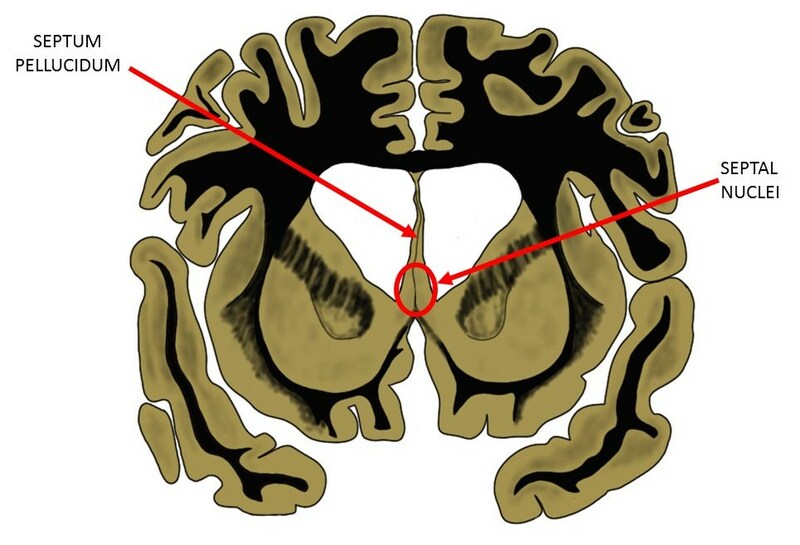 The septal area, however, including both the septum pellucidum and septum verum/septal nuclei, is still relatively poorly understood; it will take more research to fully elucidate its functions and influence on behavior. Sheehan T, Chambers R, Russell D. (2004). Regulation of affect by the lateral septum: implications for neuropsychiatry. Brain Research Reviews, 46(1):71-117.